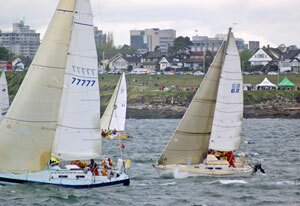 The Royal Victoria Yacht Club (RVYC) will host the 70th Swiftsure International Yacht Race May 25 to 27. Good Old Boat has been a sponsor of this venerable race since 2004. This year's "Canvas to Carbon" theme celebrates the incredible changes in technology that have occurred throughout the lifetime of the Swiftsure. Good old boats have always been welcome in the Swiftsure, however for the 70th running, race organizers are making a special appeal to owners and skippers of good old boats to get involved. This is no ordinary yacht race; it's a festival of excitement and camaraderie that draws the Pacific Northwest's sailboats and an international audience to Victoria, British Columbia, on Canada's Vancouver Island. More than 1,600 racers will converge in Victoria on 200 yachts, ranging in length from 24 to 125 feet. The harbor will become a buzzing hub of story-telling, last-minute preparation, and racing yachts ranging in age from the very old to the new. Whether they will be sailing or watching, visitors will experience the camaraderie, excitement, and passionate competitiveness of this large and prestigious race. This year there will be four races of varying length, ranging from the 138-nautical mile Swiftsure Lightship Classic to the short, spectator-friendly, Swiftsure Inshore Classic. Three of the races are overnight tests that race from the Victoria waterfront out the Strait of Juan de Fuca and across to the American side with turning points at Clallam Bay (79.7 nm), Neah Bay (103.4 nm), and Swiftsure Bank (138.7 nm). The Inshore Classic is a shorter race that starts at the same place as the longer races and proceeds along the Victoria waterfront and ends in Cadboro Bay near the Royal Victoria Yacht Club. It is specifically designed for those who are newer to racing or whose boats are not set up for overnight racing. Race organizers are encouraging classic boats to participate in this race to emphasize the "Canvas to Carbon" theme of the race. Registration includes three nights' moorage in Victoria (two nights before the race and one after), as well as a barbeque at RVYC for the inshore racers after the race. Several local hotels have special rates during Swiftsure. More information as well as registration is available on the Swiftsure website.